Tilbury House Publishers, 9780884485308, 160pp. Using the power of a parable and his own experiences as a Navy SEAL and accomplished entrepreneur, Mills shares his proven framework for success as embodied by the action-based acronym UPERSIST: Understand the why; Plan in three dimensions; Exercise to execute; Recognize your reason to believe; Survey your habits; Improvise to overcome; Seek expert advice; and Team up. At the core of Be Unstoppable is the parable of a young skipper who meets a remarkable, seasoned captain. This chance meeting changes the young skipper's direction in life, setting him on course to identify and achieve his dreams. Each chapter concludes with action steps distilled from the story and from Alden's experiences as a U.S. Navy SEAL Commander and a business leader and entrepreneur. You see others who have the things you want money, joy, success and suppose that they were born with special talent or into a family which made these things easy to attain. They are just lucky. What you don't know is that there is a methodology to success. 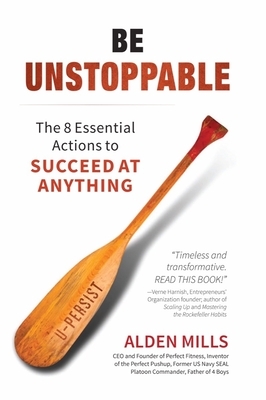 BE UNSTOPPABLE contains a system to gain this vital skillset.